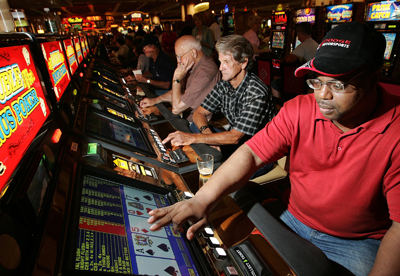 An increasing amount of casino players are choosing to play video poker. Video poker is a game that requires a certain amount of strategy if you hope to increase your odds of winning. The rules are simple because they are exactly the same as regular poker with one exception. You are playing against a machine rather than people. There are a number of ways in which you can put the odds in your favor and increase the chance of winning big. Knowing how to play the game is the first thing you must learn. Many players think they know how to play this game of chance, when in reality they have no idea what they are doing. As stated previously the game is played against a machine rather than live players. You will be dealt five cards. You can choose to take five new cards or any number that you wish. Each card will have a hold button displayed beneath the card. If you choose to keep it, simply hit the hold button. To get your discarded ones replaced, you then hit the play button. At this point the cards you have are the ones that you have to play. There are just a few basic rules that a gambler needs to learn to be successful at the game of video poker. Knowing ways that can put the odds in your favor is the best strategy of all. Using a standard fifty two card deck, the hand combinations are well over two million possibilities. The video poker machine is set to program the possible ways in which one can get any of those hand combinations. Due to this set probability, the house will adjust the pay tables to give them the edge. The machines themselves are set in exactly the same way with the exception of the flush, the full house, and the royal flush. All of this determines that you should always play the machines that have the greatest payouts. Playing a jacks or better game on a 9/6 machine will get you payout odds of 99.5%. The 8/5 machine will pay at 97.5%; 7/5 at 96.3%; and 6/5 for 95.2% based on the chances of a flush draw. At a glance you can see the the 9/6 machine will pay out the most often. The same machine will hit a royal flush once in forty thousand hands, while an 8/5 machine would hit on a flush only once in forty five thousand hands. As the percentages drop so do the chances of hitting the flush. You also should use the maximum number of coins that your game will allow. Doing this will guarantee a five to one payout with any winning hand. The only exception will be the royal flush that will pay a much higher amount. Playing less than the maximum amount only allows you to put more hands of play into someone else’s favor. That royal flush is going to pay off at a certain point, so don’t waste the hands you play by giving the next player the better odds.